Join the discussion on our forums! Come discuss Beckoner of Evil over in our dedicated Beckoner of Evil discussion topic. 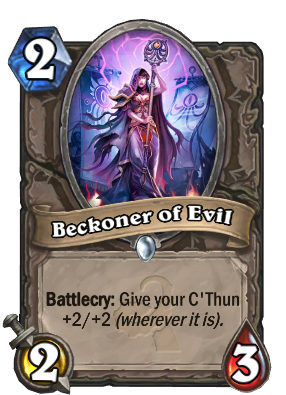 Battlecry: Give your C'Thun +2/+2 (wherever it is). So what if you play it but you don't have a C'thun? It still shows the buff animation, and cards that depend on his stats, such as Twin Emperor Vek'lor and Ancient Shieldbearer still work as long as the buff is shown as over 10/10. The card art is brilliant! Are there more people that didn't get this card along with C'thun? Trades well with the new Knife Juggler and survives to be healed/PW:Shielded for further value. Not that bad an option for C'thun Priest. What if Cthun was killed, this was played and was resurrected? Wrong, Resurrect takes a random minion from the graveyard. And it's been confirmed C'Thun buffs are tied to the player, not the minion. This means if you return it to your hand and play it then it will still have the buffs and if you resurrect it then it'll still have the buffs. Graveyard was sort of an example I was using. Basically your dead minions, and Resurrect takes a random one and resummons it. However, C'Thun is different. I remember reading C'Thuns effects were tied to the player in a couple places however can't remember where they were. I remember NoxiousGLHF confirming it in this video though. https://www.youtube.com/watch?v=DWvkMKB7QdI and you can check out the comments for a couple people talking about it. Yes, it gets buffs even when dead and once you resurrect it or return it to your hand it'll still have the buffs. That's what I mean by "Tied to the player and not the minion". The mechanics for C'Thun are much more unique because of this. Oh, and here's how silence works with C'Thun: Once you silence a C'Thun, it will be a 6/6 unless the opponent returns it to his hand which undoes the silence and because the buffs are tied to the player C'Thun will be rebuffed once played. The problem I have with both C'thun worshippers released, is that they really don't do anything. If you compare this to Darnassus Aspirant, Flame Juggler or Sunfury Protector, you might as well play a River Crocolisk. On the other hand, I guess we'll have to wait and see just how good the other cultists are and how the rest of the set interacts with these cards. I find it hard to believe that playing basic minions and waiting for C'thun will win you the game, even though it will be frickin' awesome the time it works. Maybe they can synergize well in a priest or warrior control deck, used like an extra win condition. And by the way, the flavor of these cards is DA BOMB! By the way guys this card is free aswell. So you can create a C'thun deck as a F2P player instantly! Actually it fits perfectly in a shaman deck. CHeck the deck the idea is there even if it's not perfect but anyway we need to know the new cards ! The best looking gold card.